Suited for the whole family, the outdoor and indoor family action packs give you a chance to explore a unique trail through the museum. 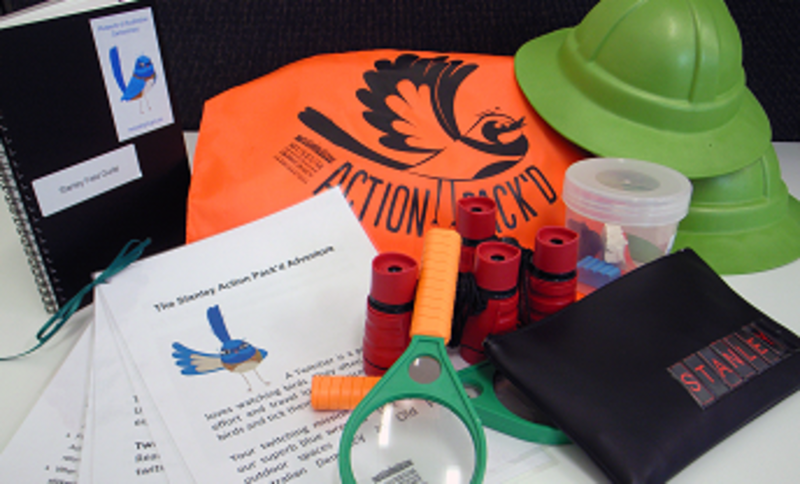 Everyone can get involved in these adventures; action packs are available all day, every day. There is no additional charge, simply ask one of our friendly staff when you arrive, provide identification to sign out a pack and you are on your way! This outdoor adventure Stanley Action Pack will get you exploring the grounds of Old Parliament House in search of the one and only Stanley, the Superb Blue Wren, and his feathered friends. You will receive a safari hat, binoculars, magnifying glasses and the opportunity to note your observations of Stanley and his friends in our collaborative bird-watching journal. Stanley is hiding out there somewhere; do you have what it takes to find him? The Press Gang Action Pack sends you hot on the heels of a breaking news story as you step back in time to a world of typewriters and shorthand. You will catch a glimpse of what it was like to be a reporter inside at Old Parliament House. Grab your microphone; the next leak might only be seconds away.